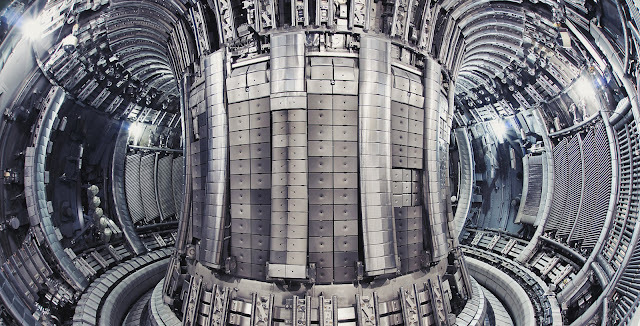 After being turned on for the first time, the UK’s newest fusion reactor has achieved first plasma. This simply means that the reactor was able to successfully generate a molten mass of electrically-charged gas — plasma — inside its core. Called the ST40, the reactor was constructed by Tokamak Energy, one of the leading private fusion energy companies in the world. The company was founded in 2009 with the express purpose of designing and developing small fusion reactors to introduce fusion power into the grid by 2030. Now that the ST40 is running, the company will commission and install the complete set of magnetic coils needed to reach fusion temperatures. The ST40 should be creating a plasma temperature as hot as the center of the Sun — 15 million degrees Celsius (27 million degrees Fahrenheit) — by Autumn 2017. By 2018, the ST40 will produce plasma temperatures of 100 million degrees Celsius (180 million degrees Fahrenheit), another record-breaker for a privately owned and funded fusion reactor. That temperature threshold is important, as it is the minimum temperature for inducing the controlled fusion reaction. Assuming the ST40 succeeds, it will prove that its novel design can produce commercially viable fusion power. Nuclear fusion is a potentially revolutionary power source. It is the same process that fuels stars like our Sun, and could produce a potentially limitless supply of clean energy without producing dirty waste or any significant amount of carbon emissions. In contrast to nuclear fission, the atom splitting that today’s nuclear reactors engage in, nuclear fusion requires salt and water, and involves fusing atoms together. Its primary waste product is helium. It’s easy to see why scientists have tried to figure out how to achieve this here on Earth, but thus far it’s been elusive. The journey toward fusion energy undertaken by Tokamak Energy is planned in the short-term and moving quickly; the company has already achieved its half-way goal for fusion power delivery. Their ultimate targets include producing the first electricity using the ST40 by 2025 and producing commercially viable fusion power by 2030.